In the autoimmune disease systemic lupus erythematosus or SLE, the immune system produces antibodies against parts of the body itself. How cells that produce those antibodies escape the normal "checks and balances" has been unclear, but recent research from Emory University School of Medicine sheds light on a missing link. Investigators led by Ignacio Sanz, MD, studied blood samples from 90 people living with SLE, focusing on a particular type of B cells. These "DN2" B cells are relatively scarce in healthy people but substantially increased in people with SLE. People with lupus can experience a variety of symptoms, such as fatigue, joint pain, skin rashes and kidney problems. Levels of the DN2 cells were higher in people with more severe disease or kidney problems. DN2 B cells are thought to be "extra-follicular," which means they are outside the B cell follicles, regions of the lymph nodes where B cells are activated in an immune response. "Overall, our model is that a lot of lupus auto-antibodies come from a continuous churning out of new responses," says postdoctoral fellow Scott Jenks, PhD, co-first author of the paper. "There is good evidence that DN2 cells are part of the early B cell activation pathway happening outside B cells' normal homes in lymph nodes." "Our work provides further support for the importance for TLR7 in lupus pathology," he says. 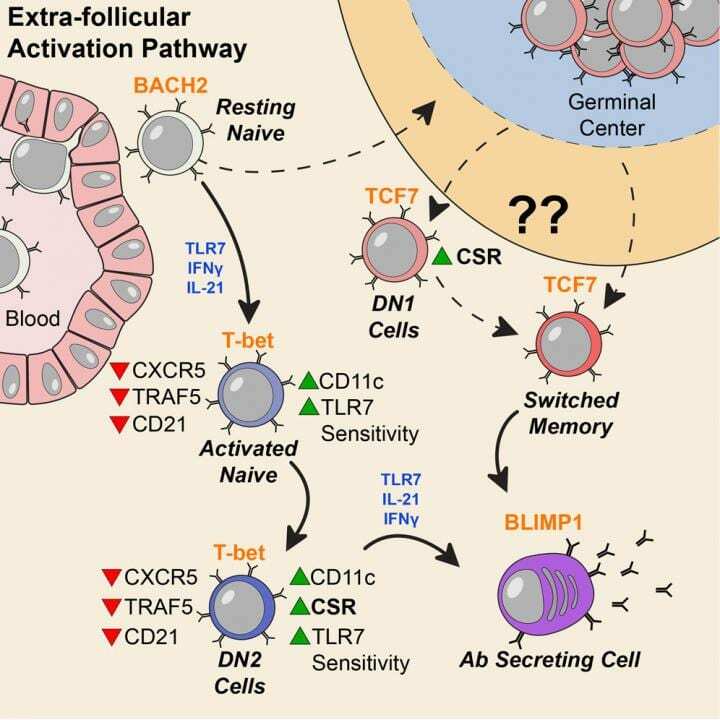 "Targeting TLR7 might both block the generation of pathological B cells and prevent their subsequent activation and differentiation into plasma cells." Previous work in Sanz's lab had shown that a group of "activated naïve" B cells are precursors to the problem plasmablasts. Those cells are very similar, in their molecular markers, to DN2 cells. Jenks says the researchers are now figuring out the relationship between DN2 and activated naïve cells, as well as investigating additional intervention strategies that could specifically control those cells.